These days, having a visually stunning mobile app isn’t good enough. For your mobile app to see success, it must be designed with user experience (UX) in mind. Push Notifications are a great means of interacting with consumers even when they are not using the application. This guide will walk you through setting up your project for rich push notifications, you will learn some server-side requirements and we will peek into the infinite possibilities! Open an existing Xcode project or create a new project. Select your project target and go to Capabilities to enable Push Notifications as shown here. Open Keychain Access > Certificate Assistant > Request a Certificate From a Certificate Authority... Fill the required fields and choose either to email CA the request or save it to disk. Go to your Apple member center and locate your App ID. You will see that "Push Notifications" service is now Configurable. Select the Edit button. Under Push Notifications section there are two options for certificates as shown here. Select the Create Certificate button to create your Certificate. Development Certificate - App built from Xcode will receive notifications. Production Certificate -App installed from Apple Store or Test Flight will receive notifications. Upload your .certSigningRequest file that you prevously saved on disk or emailed the Certificate Authority, download your generated Certificate, and double-click the .cer file to install it in your Keychain Access. Add the didRegisterForRemoteNotificationsWithDeviceToken function in your AppDelegate.swift file to get the deviceToken, which will receive notifications. 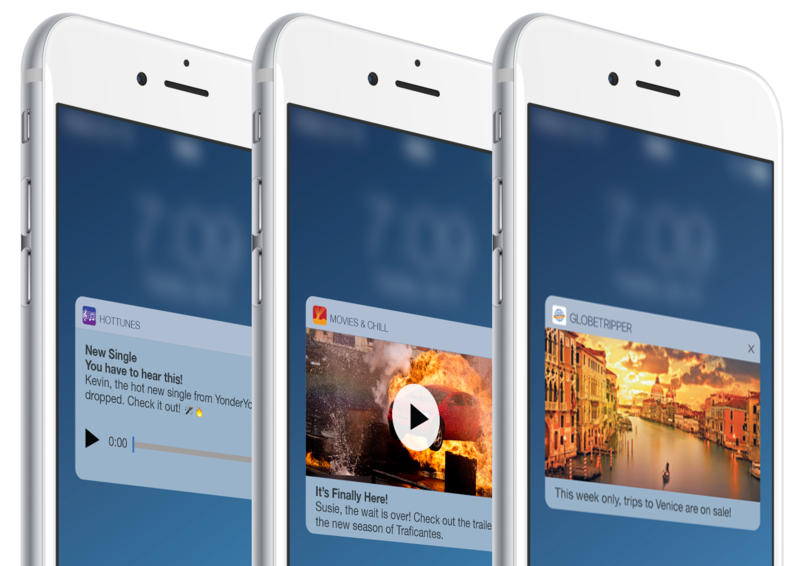 Your notifications interface should feel like natural extension of your containing app! A very important step for sending media attachment is the mutable-content key in the push payload from the server. So let's take a look at this example payload. From Xcode > File > New > Target..., select Notification Service Extension and activate suggested scheme. Notice that there are two autogenerated files now - NotificationService.swift and Info.plist. Let's add some actions to our Rich Push Notifications. Modify the payload by adding the "category" key to notify that we want to display actions. Warning! Don't forget to update the badge icon number when needed! Last, but not least, let's add a custom preview for notifications from Xcode > File > New > Target... select Notification Content and activate suggested scheme. Now we have NotificationViewController.swift, MainInterface.storyboard and Info.plist files. Let your imagination run wild as you use your newfound abilities to build richer and richer push notifications for IOS apps. or take a look at the sample project included below to continue practicing with some cool ideas! If you found this guide informative, engaging, or just plain awesome. Thanks for reading!